The files are grouped in folders organized by the domain the actions pertain to. To create the necessary action files and directory structure for the first time, use the recommended Kibo eCommerce Yeoman Generator scaffolding tool, as described in the Quickstart. 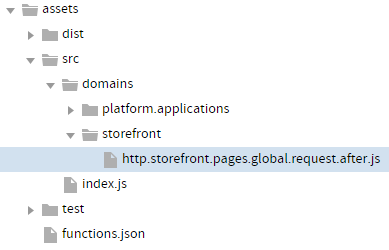 The following image shows the http.storefront.pages.global.request.after action file located in the storefront domain folder. When you code the custom function for an action, you have access to two arguments: context and callback. The context argument provides the function access to relevant objects and methods that interface with Kibo eCommerce. The following table summarizes a few of the context objects and methods you can use to enhance the functions you develop. Refer to the reference content for full details about the context argument available for each action you are coding a custom function for, or log the context object to view its data. apiContext Provides mostly read-only access to standard API variables, such as the tenant, site, master catalog, user claims, etc. configuration Provides read-only access to configuration data that you set in the Action Management JSON editor. exec Provides read and write access to functions that act on Kibo eCommerce objects. The methods accessible by exec vary depending on the action you are coding the function for. get Provides read-only access to certain Kibo eCommerce objects. The objects accessible by get vary depending on the action you are coding the function for. request Provides read access to the HTTP request made to the API endpoint the action accesses. response Provides read and write access to the HTTP response made to the API endpoint the action accesses. ...the Kibo eCommerce order resource updates with the new custom field but the order variable still retains the original value of the order resource at the time of the GET operation. If you want the variable to update to the latest value of the Kibo eCommerce order resource, you have to use the context.order.get method again. Important: To ensure that your Arc.js function does not halt the Kibo eCommerce runtime or break storefront functionality, arrange callbacks so that they are the last pieces of code to execute within your function. // Note: This code demonstrates using callbacks within a simplified if-else function structure. The recommended structure for Arc.js functions is the try catch statement, as explained in the next section. The try catch statement is useful for handling any errors that may occur in your Arc.js functions. It tells Kibo eCommerce to try to execute a block of code, and catch errors if they occur in the try block. Note, however, that the catch block does not detect errors that occur within a Promise chain. To catch these errors, use a .catch statement at the end of the Promise chain. Important: To ensure that your Arc.js function does not halt the Kibo eCommerce runtime or break storefront functionality, place callbacks within the try catch statement.If you are familiar with try catch statements, you may know that you can also employ a finally block to execute a final block of code, regardless of whether an error occurred in the try block. Counterintuitively, however, the finally block executes before Promise chains, and because you will likely employ Promises in your Arc.js functions, use of the finally block is generally not recommended. // For starters, run some cool code. // Run this cool Promise chain. Interested in learning more about try catch statements? The Mozilla Developer Network has a good writeup on the topic. One of the benefits of the Arc.js framework is that it allows you to leverage the thousands of NPM packages developed by the Node.js community. The following code blocks provide an example of loading the Needle HTTP client for use in Arc.js. Note: When integrating third-party packages, always load the smallest package possible. If the functionality you require is offered as a subset of the complete module, load the smaller module to minimize delays on your storefront. Install the package using npm by opening a command prompt in your project folder and entering npm install package name. Install the SDK using npm by opening a command prompt in your project folder and entering npm install --save mozu-node-sdk. Require client factories using the “deep require” method shown in the preceding code block, which requires only the subset of the module that is needed. This saves you upload space compared to requiring the entire SDK using require(&apos;mozu-node-sdk&apos;). The context object includes user claims for the currently active user in a Kibo eCommerce store. These user claims have a “shopper” level of permissions, but the example requires claims that can make calls to the API. If you want to make calls that require more privileges than the shopper has, set the context user claims to null, as shown above in the preceding code block. The Kibo eCommerce Node.js SDK convention of looking for a mozu.config.json file for initialization does not work with Arc.js. Instead, pass the context object to the client factory (or constructor) so that the SDK client initializes with the appropriate tenant, site, catalog, and authentication details. When handling errors, communicate a success by calling callback() with no arguments. Communicate an error by calling callback() with the error provided. Note that you can pass callback() directly into a .catch() method on the Promise returned by the SDK. If you want to handle errors differently than described, you can write your own error handler. Retention of user claims on the cart resource, so that the extended properties are scoped to the shopper (in general, cart operations require user-level permissions to execute correctly). Removal of user claims from the order resource, so that you can query the API about order history, which is beyond the scope of the shopper&apos;s user-level permissions. //Require the components of the Kibo eCommerce Node.js SDK that you need. These "Factories" help you generate Kibo eCommerce resources with appropriate context. //Each of these Factories will need to receive an apiContext object to gain authorization to make API requests. //Wrap functionality in a try/catch block. This prevents errors from stalling your Kibo eCommerce storefront. //The context.apiContext contains both app-claims and user-claims. //The user-claims allow for making API requests scoped to the user who initiated this Arc.js action (adding an item to the cart). //The app-claims allow for making API requests scoped beyond the permissions of a user and are used to affect data in the Kibo eCommerce workflow. //Since Order API calls are scoped outside of the permissions that a user is allowed, you&apos;ll remove the user-claims from the Order Resource you create. //Note: The original context.apiContext object is not altered. //Carts are scoped directly to the users who own them. //You retain the user-claims so you can write extended properties on the cart, which belongs to the shopper. //Use the .catch statement to handle errors in the Promise chain. //Be sure to execute a callback in case of errors to refrain from halting Mozu storefront execution. //Use a catch block to handle errors that occur in the try block, outside of Promise chains. You can set custom data within storefront HTTP after actions, and then expose that data in your theme for use on storefront pages. On the Arc.js side, you set the custom data in the context.response.viewData object. On the theme side, you access the data from the viewData variable, where it is stored as a top-level JSON object. Note: The context.response.viewData object contains an object called model, which represents the model for the current page. While you can access and modify the model object through Arc.js, you cannot add custom data that doesn&apos;t already exist in the model object. You can only set custom data at the context.response.viewData level. Use the after version of a storefront HTTP action. Access the data within a theme template that executes the same route as the Arc.js action in which you set the data. The following table demonstrates example relationships between Arc.js actions and the theme templates that can access their custom data. fullName A name for your entry, in the form of name@namespace, where the namespace must match the namespace of your developer account.Note: If the name you choose already exists within the namespace, then the POST operation overwrites the previous value. value A JSON object that represents whatever sensitive information you want to encrypt. While the Kibo eCommerce API receives, encrypts, and stores each credential store entry, it does not support retrieving an entry. To decrypt and access a credential store entry, use the getCredential method available in the context object of an Arc.js function. The Arc.js application that executes the function must be created within your developer account—other applications will not have the required permissions to run the getCredential method within your namespace. For its first argument, the getCredential method takes the value of the fullName field of the credential store entry you want to access. For the second argument, the method takes a callback. After you decrypt data using the getCredential method, you can assign the result to a variable and access the sensitive data from the entry&apos;s value object. See the following example use case for additional details. In the request body, POST the following credential store entry to the platform/extensions/credentialStore API resource: Tip: Remember that the namespace you choose should match the developer account that will contain the application for decrypting the sensitive data. Create an Arc.js application within the same developer account namespace where you posted the credential entry.